Andrew Claxton has been a well-known figure on the Oxford music scene since 1974 as a professional instrumentalist, teacher and composer. He also has an international reputation having recorded and toured in Europe, North America and Australia, and his music is performed and broadcast worldwide. 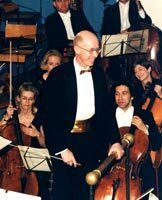 He trained in the National Youth Orchestra of GB, Royal Academy of Music, Bretton Hall College and University of Reading where he gained his M.Mus in Performance in 1986. He has extensive instrumental and class teaching experience from primary to tertiary level, has been an examiner for the Guildhall School of Music and an adjudicator at music festivals throughout the UK. He is also a forensic musicologist advising leading artists, labels and publishers on music usage and copyright matters. He was elected ARAM in the Royal Academy of Music 2000 Honours List for "distinction in the music profession". He recorded and toured with the internationally renowned band Dead Can Dance 1987-93 during which he co-wrote (with lead singer Lisa Gerrard) his best-known piece 'Sanvean' which is used in the 1995 Hermes perfume advert in France, in various European dance hits & DJ compilations and in Joan Micklin Silver's 1996 feature film 'In the Presence of Mine Enemies' in USA. In Britain 'Sanvean' is the theme tune of the long-running government immunisation campaign and was nominated at the 1998 British Television Advertising Craft Awards. In 1988 his own band Peacock Epoch was invited to tour on the Regional Contemporary Music Network giving concerts and workshops involving hundreds of young people throughout the country. He was principal tuba (doubling keyboards) in City of Oxford Orchestra 1974-2000 and in 1997 conducted it in the premiere of his 'Spires and Spirits' which had won Oxford Town Hall Centenary Composers Competition. He recorded and performed regularly with the contemporary jazz 11-piece Meltdown 1997-2001. He has composed over 50 hours of music for screen, stage and concert hall including scores for tv documentaries in Fragile Earth, Dispatches, Secret History, Horizon and Inside Story series in the UK and for Arts & Entertainment Network and Discovery Channel in USA. He is currently preparing the first album 'Cobwebs and Cogwheels' in a long series planned for the next 15 years which will showcase the talents and wide interests of this distinctive musician and his collaboration with female singers from Britain, Portugal, Colombia, Ireland, Lithuania, India and Australia. "Teaching is an important part of my musical life. I love passing on my skills and finding ways of enabling pupils to become good musicians more easily. I have always believed that enjoyment and learning are two sides of the same coin. I have a very hands-on approach and being fully musically-active during lessons is central to my teaching style. Pupils soon appreciate the importance of music-as-continuity using unique teaching strategies I have developed from mime and from sequencing. There is far more actual music making and far less talking in my lessons which is the direct opposite of the traditional approach and the dreaded 'master class'. Reading music and acquiring correct technique are still absolute priorities but are approached through the medium of attractive pieces and studies across a wide range of styles: classical, jazz and popular, world music and music from stage and screen. Scales and exercises are handled with in a uniquely creative and resourceful way. 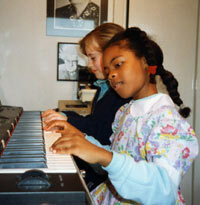 Improvisation too plays a large part in my teaching from an early age. 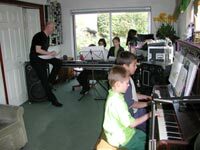 I teach piano, electronic keyboards, composition, general musicianship and studio skills to all ages and abilities for simple enjoyment and for more formal reasons like exams, festivals, auditions etc. I have my own studio at home in Cumnor Hill, within 2 minutes walk of the bus stop, exactly 3 miles west of Oxford City Centre. I teach on Mondays to Thursdays. Please ask me for my prospectus, timetable and pupil results"